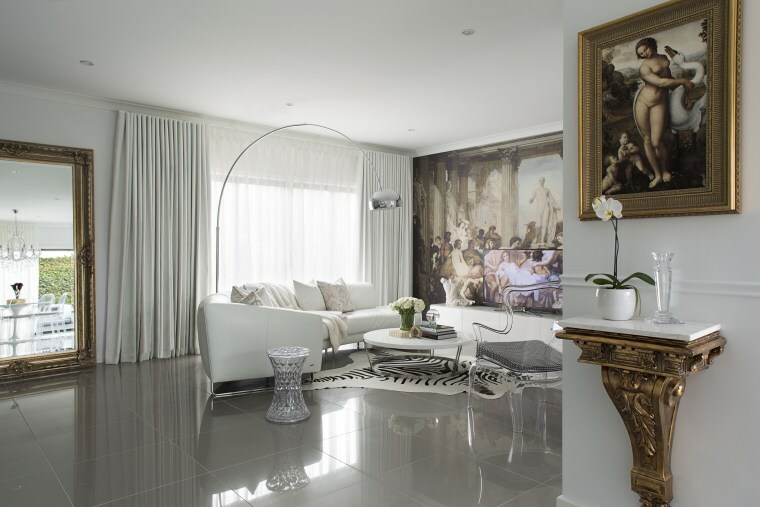 A textured wallpaper print of a Renaissance-style painting leads the aesthetic of this interior design by Massimo Speroni. No matter how complex an interior design project, there is sometimes just one dramatic idea at its heart. This house, one of two on a subdivided corner block, was already under construction when interior designer Massimo Speroni stepped in. However, he was in time to work with the owner to make some minor structural tweaks to maximise floor space and improve flow. To this end, walls were repositioned in the dining area and a dividing wall was erected between the kitchen and living areas to give more bench and storage space. In addition, two small windows were removed from the living area to provide sufficient unbroken space for an all-important feature wall. 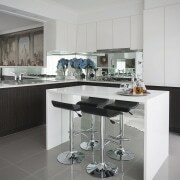 In terms of interior decor, the client wanted a home with personality and a wow factor. It also had to reflect the level of luxury you might expect in a five-star hotel, says Speroni. 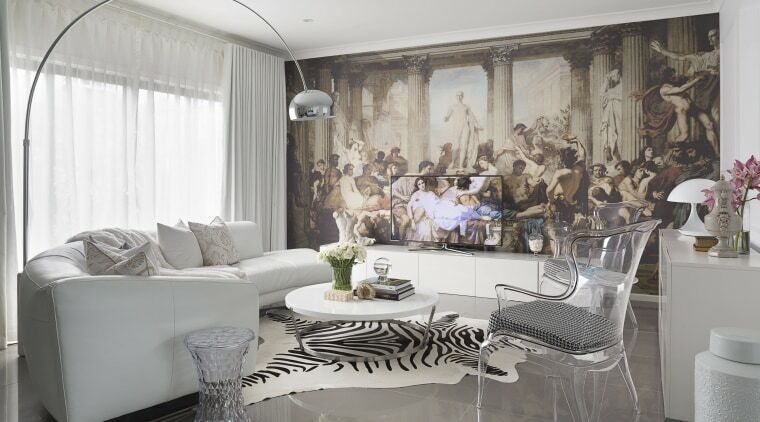 "My main inspiration was the 19th-century painting Romans of the Decadence, which the owners had seen in Paris. I had this reproduced as a washable vinyl wallpaper mural and hung on the living room wall." Rich finishes and furnishings are all inspired by the mural, with elements such as gold-painted corbels, dado rails, ornate frames and heavy drapes contributing to the atmosphere. 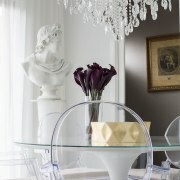 Modern Italian furniture adds playful contrasts. "Pasha armchairs from Pedrali are the shape of classical wing chairs, but being transparent, they are almost invisible within the design," says Speroni. 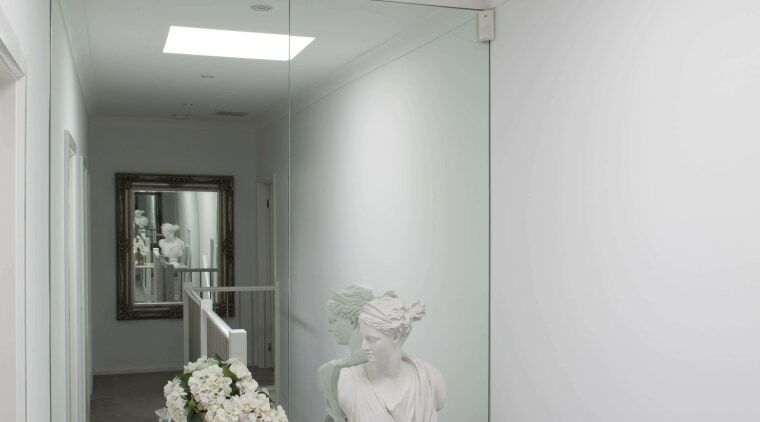 "High-gloss ceramic tiles bring uniformity and together with the mirrors, help reflect light through the spaces. 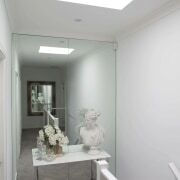 The landing on the upper level of this new house features mirrors to bounce light and increase the feeling of spaciousness. 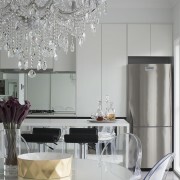 "The sense of lightness is continued in the kitchen with Louis Ghost chairs, also in clear polycarbonate, and a sparkling chandelier." In the master bedroom, a bespoke king-size headboard in white velvet, Mystere Snow from Warwick, furthers the plush aesthetic.